Jerry Coleman was getting loose before Opening Day with Andy Masur (not pictured). The Colonel, who is celebrating 70 years in baseball and 40 with the Padres, will be throwing out today’s first pitch. Eight games into the Cactus League season, the Padres are starting to heat up, winning three of their last five. 10 pitchers have yet to surrender and earned run this Spring, including Andrew Cashner (3.0 IP), Erik Hamren (3.0 IP), Alex Hinshaw (3.0 IP), Casey Kelly (2.0 IP), Cory Luebke (2.0 IP), Josh Spence (0.2 IP), Jeff Suppan (3.0 IP), Joe Thatcher (1.0 IP), Dale Thayer (3.0 IP) and Nick Vincent (3.0 IP). Leubke joins Dustin Moseley, Clayton Richard, Tim Stauffer and Edinson Volquez in what has become a Spring Training rotation and could project to be the clubs’ starting staff come Opening Day. Those five have combined to post a 3.46 ERA, surrendering five earned runs in 13.0 innings of work while striking out 10. On offense, the Padres are hitting at a .276 clip with a .332 on-base percentage and .430 slugging percentage. Leading the way are 10 Friars who are hitting .300 or better with at least five games played: Yonder Alonso, Matt Clark, Jaff Decker, Jonathan Galvez, Jeremy Hermida, Rymer Liriano, Carlos Quentin, Edinson Rincon, Blake Tekotte and Will Venable. Decker is the only Padre with multiple home runs, having gone deep twice while driving in a club-high four runs. The Padres announced today that they have locked up Cameron Maybin, signing him to an extension that keeps him in San Diego through 2016 with a club option for 2017. 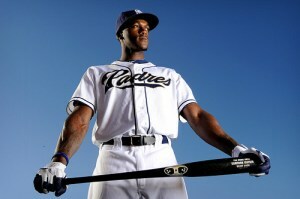 The extension buys out Maybin’s arbitration years and gives Padres fans (that’s you) a big reason to celebrate. Maybin had a breakout year in 2011, establishing new career highs in nearly every offensive category, including games, runs, hits, doubles, triples, home runs, RBI and stolen bases, en route to being unanimously chosen as the Padres 2011 MVP by the San Diego Chapter of the BBWAA. He started 132 games in center field and led the team in runs, triples, stolen bases and multi-hit games. On the year, he hit .264 (136-for-516) with 24 doubles, eight triples, nine home runs, 40 RBI and 82 runs scored. Maybin also stole 40 bases in 48 attempts, posting an 83.3 percent success rate that ranked 12th in the National League. He was successful in 21 consecutive attempts from May 18-August 8, including stolen bases in a franchise-record six straight games from July 19-24. Originally signed by Detroit as the 10th overall selection in the 2005 First-Year Player Draft, Maybin made his Big League debut with the Tigers in 2007 and was traded to the Marlins prior to the 2008 season. He spent parts of three seasons with the Marlins before being acquired by the Padres in exchange for right-handed pitchers Ryan Webb and Edward Mujica on November 13, 2010. One of the Padres last Spring Training additions has one of baseball’s most interesting player profiles. Micah Owings, a 6-5 right-hander from Gainesville, Ga., has appeared in 180 Major League games over parts of five seasons, making 68 starts and 64 relief appearances. So what happened in the remaining 48 games? Owings, a career .286 hitter, has regularly been used as a pinch-hitter…and a powerful one at that, belting nine home runs in his career. His .507 slugging percentage ranks 27th among all active players with at least 200 at-bats, besting some of baseball’s top sluggers. In fact, here are the 10 players who rank immediately below Owings on that list (in order): Hanley Ramirez, Alfonso Soriano, Troy Tulowitzki, Chase Utley, Nelson Cruz, Allen Craig, Adam Dunn, Maglio Ordonez, Kendry Moralez and Pablo Sandoval. His hitting prowess was apparent early in his career, winning the Silver Slugger his rookie year as he thrashed opposing pitchers to the tune of a .333 average (20-for-60) with seven doubles, one triple, four home runs and 15 RBI. He averaged a home run every 15 at-bats and an RBI every four at-bats that season. On 8/18/07 at ATL, he established Diamondbacks’ single-game records for pitchers with four hits, two home runs, six RBI and four runs scored. It was the first time in 50 years that a pitcher tallied 11 total bases in a single game. Over the next two years, he was used a combined 34 times as a pinch-hitter between ARI and CIN, hitting .273 with a .545 slugging percentage in the pinch. For a complete look at his batting statistics, check out Owings’ player page at baseball-reference.com. His home run list can be found here. While his role with the Padres has yet to be determined, don’t look for this hurler to be squaring around to move the runner when he comes to the plate in 2012. The Padres come to Spring Training with a new-found depth at catcher, a strength that goes beyond the seven players in Big League camp. Reporting along with the pitchers on Sunday were Nick Hundley (no introduction needed), John Baker (acquired from MIA in exchange for Wade LeBlanc) and Yasmani Grandal (acquired from CIN in Mat Latos trade), all off the 40-man roster. Also in camp are non-roster invites Brad Davis, Jason Hagerty, Eddy Rodriguez and Ali Solis. Not far behind is one of the Padres most exciting prospects. Austin Hedges, a 19-year-old catcher out of San Juan Capistrano, was selected by San Diego in the second round of the 2011 First-Year Player Draft. Hundley enters camp expected to be the Padres go-to man behind the dish. He is coming off a year in which he set career highs in nearly every offensive category, including runs, hits, triples, home runs, batting average, on-base percentage and slugging percentage. Hundley also started a career-high-tying 73 games behind the plate, a total he is likely to top in 2012. The acquisition of Grandal from MIA instantly inserted a top catching prospect into the Padres organization, strengthening the club’s position as having one of the top minor league systems. Ranked by Baseball-America as the Padres’ No. 2 prospect and No. 53 in all of baseball, Grandal flew through the minors last season, playing at High-A, Double-A and Triple-A in the Reds organziation. Hedges has been named the Padres No. 6 prospect by Baseball-America despite playing just nine games as a professional. He was widely considered the top defensive catching prospect when selected 82nd overall in the 2011 draft. A native of Peoria, AZ, Decker grew up just down the street from the Padres Spring Training Complex. He was selected by the Friars with the 48th overall selection in the 2008 draft and has hit .273 with a .411 on-base percentage and .475 slugging percentage over his four seasons in the Padres system. 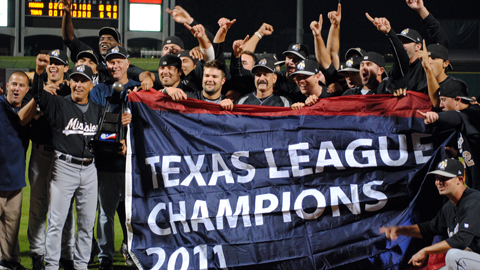 He reached Double-A for the first time last year, helping the San Antonio Missions to the 2011 Texas League championship. So far with the Peoria Javelinas this Fall League, Decker is hitting a monstrous .500 (11-for-22) with four walks. 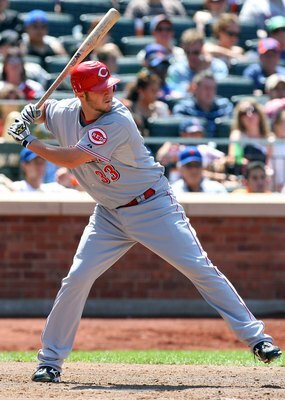 He has posted a .593 on-base percentages, having reached safely in 16 of his 27 plate appearances. Time for our fourth Future Friar installment as we try to introduce you to some of the players you are likely to see at PETCO Park in the future. Today we visit someone you are probably fairly familiar with already. He made his debut this year and is likely to return before the season is over. He figures to be a large part of the Major League team going forward. Meet…Anthony Rizzo. Anthony Rizzo, 22, was born on August 8, 1989 in Fort Lauderdale, Fla. He played his high school ball at Marjory Stoneman Douglas High School in Florida, hitting .468 his senior season. That performance resulted in his selection in the sixth round of the 2007 Draft by the Red Sox. In the Sox minor league system, Rizzo hit .284 (307-for-1080) with 85 doubles, 38 home runs, 180 RBI and 170 runs scored in 282 games over four seasons before being acquired by the Padres as part of the trade that sent Adrian Gonzalez to Boston. While posting solid numbers on his journey through the minors, Rizzo faced his largest challenge off the field. At the age of 18, while playing with the Red Sox Single-A Greenville affiliate, he was diagnosed with limited stage classical Hodgkin’s lymphoma. To combat the disease, Rizzo underwent six months of chemotherapy treatments after which doctors informed him that the cancer was in remission. When he returned to the field, he picked up right where he left off, terrorizing minor league pitching. He played two more seasons in the Sox system before joining the Padres last offseason. After a solid performance at Big League camp for the Friars, Rizzo was sent to Triple-A Tucson to begin the 2011 campaign. It was here that his numbers really took off. Over the first couple months of the season, Rizzo hit .365 with a .444 OBP and .715 SLG (1.159 OPS), earning a promotion to the Padres. He made his Major League debut on June 9, collecting a triple for his first Big League hit. The trip to the Majors served as a reality check for Rizzo, as his numbers came back down to earth. He was optioned back to Triple-A on July 21, his offensive attack picking right back up. Upon his return to Tucson, he hit safely in nine of his first 12 games, going 18-for-48 (.375) with seven doubles, six home runs and 22 RBI. In 80 total games at Triple-A this year, Rizzo has hit .345 (105-for-304) with 31 doubles, one triple, 23 home runs, 95 RBI, 56 runs scored, a .422 OBP and .681 SLG. In addition to his hot bat, the 6-3, 220 pound first baseman has committed just 11 errors in 689 chances at first base, posting a .984 fielding percentage. Here’s a great fan video of Rizzo’s first hit from the Padres June 9 win over the Nationals. Skip ahead to 1:30 for the good stuff. A performer from KÀ by Cirque Du Soleil delivered the first pitch prior to Monday’s game. Nice flinch by Clayton Richard. Reliever Josh Spence made his Major League debut last night, working a perfect ninth in the Padres 11-2 win over the Braves. The outing made Spence the seventh player to make his Big League debut with the Friars this season, joining Cedric Hunter, Blake Tekotte, Logan Forsythe, Anthony Rizzo, Anthony Bass and Evan Scribner. Tonight the Padres take on the Braves in the second of a three-game series. The game marks the eighth of nine tilts between the two clubs this season, with the Padres holding a 4-3 edge so far. A win tonight would clinch the season series against Atlanta for the first time since going 5-1 in 2005. Dustin Moseley takes the hill tonight, looking for his third win of the season. Over his last five starts, he has gone 1-0 with a 2.37 ERA (8 ER/30.1 IP). Moseley will be facing the Braves for the second time this season. With Interleague Play wrapping up in the next week or so, we asked some of the Padres who have experience in both leagues to compare the different game styles. Clayton Richard (White Sox/Padres) and Rob Johnson (Mariners/Padres) give their take on having the pitcher hit. Aaron Cunningham (A’s/Padres – currently with Tucson) weighs in on the opportunity that role players are given in the NL. Finally, Bud Black (coached and played in both leagues) shares his thoughts on the strategy that goes into a National League game.